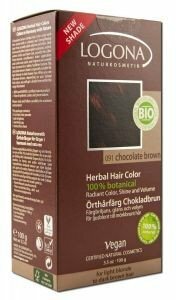 Chocolate brown Herbal Hair Color coats each hair strand with a coloring and strengthening layer that actually adds volume and shine. Only henna and other natural plant colorants provide the color. Plant-derived conditioners make application and comb-out easier, and improve your overall hair structure for a softer, healthier texture. The chocolate brown shade is especially suitable for light blonde to dark brown hair. When you use chocolate brown, depending on your natural hair color, you will get a shade within the range illustrated. Contains only henna and other natural plant colorants , such as walnut shells and beet root , provide the color. If you have any questions about this product by Logona, contact us by completing and submitting the form below. If you are looking for a specif part number, please include it with your message.